Yesterday, I went to Digital: From Idea to Audience, a small conference (more of a large workshop actually) put together by Royal Pavilion and Museums, Brighton and Hove, with funding from Arts Council England. I might have enjoyed a trip to Brighton, but this actually took place in central London, just across the road from the BBC. The programme was put together by Kevin (not that Kevin) Bacon, Brighton’s Digital Development head honcho. (By the way – I’m going to quote from this post in my forthcoming presentation at Attingham.) Kevin stated at the outset that the day didn’t have a theme as such, but rather a “Nuts and Bolts” conference, a response to many of the questions he had been asked after making presentations elsewhere. He hadn’t briefed the speakers, only chosen them because he had felt they might have experiences and learning of use to people working on digital projects. But if a united theme came out of the day, then it was Keep Asking Why? Kevin kicked off the day talking about his work at Royal Pavilion and Museums, Brighton and Hove, a number of sites across the city (including Pavilion istelf, Preston Manor, the Booth museum and both Brighton and Hove museums) that attract around 400,000 visitors a year. They hold three Designated collections (of national importance). He wanted to talk about two digital projects one of which was (broadly) unsuccessful, and the other (broadly) successful. 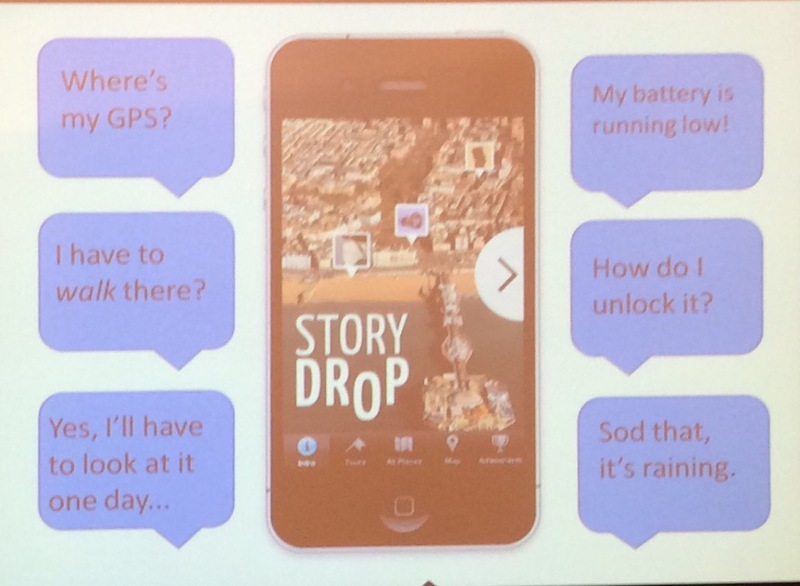 The first was Story Drop, a smartphone app that took stories from the collection out into the wider city. GPS enabled, it allowed people to take a tour around the city based on an object from the collection. Get to a location and it tells you more about it, and unlocks another object. As an R&D project, it worked. Piloting it, they had very favourable responses. So they decided to go for a public launch in January of 2014. The idea being that lots of local people would have got a new phone for Christmas, and be keen to try out a new app. The launch turned out to be a damp squid. The weather was partly to blame, January 2014 was one of the wettest on record. But even when the streets dried out, take-up was not massive. Kevin said to me during the break, that maybe only hundreds of people have downloaded the app to date, two years later. He showed a slide detailing some of the reasons why people weren’t using it. These reasons chimed with my own research. It wasn’t an unmitigated failure, people do love it – but only for a very small number of people. So he said, think about why people will use your digital project. Which is the approach he took for the redevelopment of the Museum’s website, shifting from designing for demographics to designing for behaviours (motivations, needs, audiences). And that was far more successful : 23% increase in page views and 230% increase in social shares. Then, Gavin Mallory from CogApps took the floor to talk about briefs. He has already put his presentation on Slideshare. As experienced providers to the cultural heritage industry, they’ve seen a lot of briefs. Some good, some wooly, or overly flowery, too loose, too tight, too re-cycled, or as Giles Andreae would have it “no [briefs] at all!” I must admit, I’ve been guilty of a few of those.